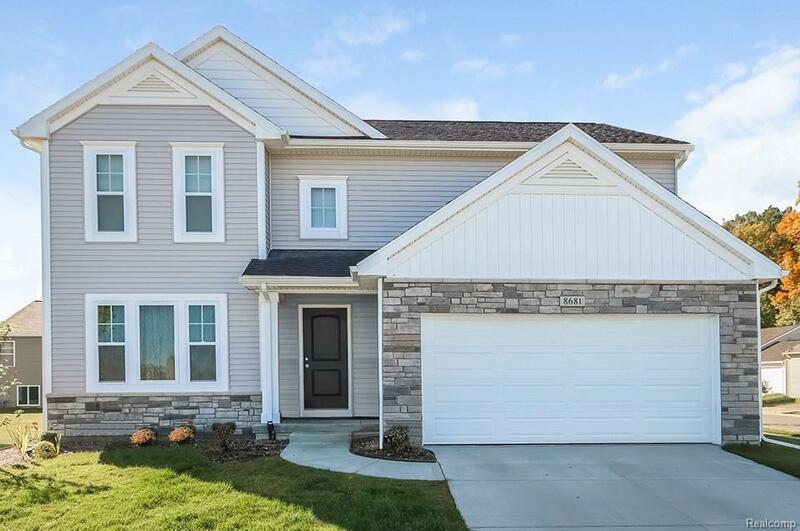 To be complete August 2018,4 bedroom, 2.5 bath home in Grand Blanc Woods, situated in the Grand Blanc School District, this established community, invokes a home town feeling in a quiet setting, yet it is still close to shopping centers, major health care providers and restaurants. RESNET ENERGY SMART NEW CONSTRUCTION, 10 YEAR STRUCTURAL WARRANTY. An open floor plan welcomes you home and is created by a large great room, dining nook and kitchen. Kitchen features castled cabinets, center island, granite counters, tile backsplash and SS; dishwasher, range and microhood. Easily accessed from the kitchen are a walk in pantry and separate mudroom. Powder room completes the main floor living space. A master suite with a private full bath and large walk in closet, 3 more spacious bedrooms, another full bath and 2nd floor laundry create the upper level with style and convenience. Large patio creates an outdoor space. Home has 23 yr age advantage. One time $200 road fee at closing.